To see upcoming events, news, and more CLICK HERE. Currently, we meet Sunday mornings from 10:00 to 12:00. During that time there are three periods of zazen (meditation), a zen talk, and private interview (dokusan) with the teacher. We also meet for two periods of zazen on Wednesday evenings from 7:00 to about 8:30. Note: The zendo is closed on Sundays following sesshin. 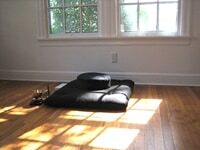 COST: There is no cost for our weekly zazen sessions. We do have a donation bowl, and it is much appreciated if, each time you attend, you can make a small offering to help support the zendo. All day sittings (sesshin) are usually the fourth Saturday of every month from 9:00am to 5:00pm. COST: $25 for non-members, $20 for members, with a $5 oryoki bowl rental fee for those who do not have their own oryoki bowl set. Please arrive early for all events–about five or ten minutes before the stated beginning time. Our daily sitting schedule will expand to mornings and other evenings as we continue.